On Sunday my youngest and I were out and about in the city with our scooters. We both enjoy that. We scoot aimlessly right through the city and discover something new. Two stone snakes high up on the facade, the exhibition «The Wolf in Switzerland” in the Zoological Museum, an amusing poster full of artificial teeth in the Weinbergstrasse. Uphill I can stay with my youngest. One can’t scoot anyway, but has to walk beside the Trotti or run with it on one’s shoulder. If it is flat, he is quicker and with a great effort I can just about keep up. In the meantime, downhill I have no chance against him. 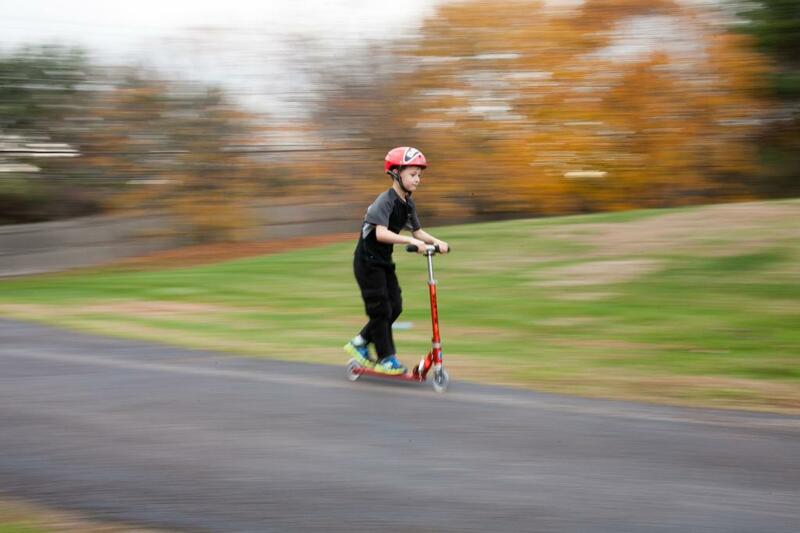 He is so fast, scoots like a devil without braking. When we set ourselves up on the Rigiblick to enjoy the ride down to the city, we always agree that he’ll wait for me at the bottom of the hill. I just can’t keep up. That is a bit discouraging and frustrating, but that’s how it is. In the meantime I’ve come to accept it. It is like when I went snowboarding with my elder daughter. Although we had both learned snowboarding together, at some time she was faster, much faster than me. She always waited for me halfway down the mountain and when I arrived, she moved on again. And so at the end of the day I was completely k.o. Yes, at some time one becomes more careful, is conscious of the risks, makes allowance for them. Passage of time or wisdom, depending on how you look at it. Categories: My Blog | Tags: Ageing, family, scooter, Sparetime, speed, Trottinette | Permalink.